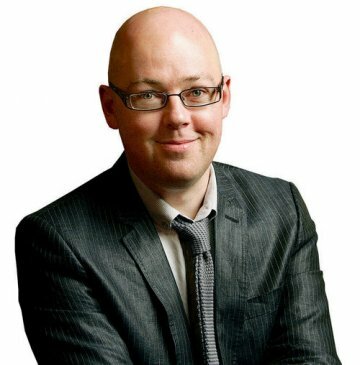 As part of the celebration of Vintage Children's Classics this week, I feel honoured to have John Boyne on the blog. His children's novel, The Boy With Striped Pyjamas was a phenomenal book which basically made the world cry. John is here today to talk about the inclusion of this book in the new Vintage Children's Classic selections as well as to tell us about his new book The Terrible Thing That Happened to Barnaby Brocket. Your new children’s book, The Terrible Thing That Happened to Barnaby Brocket is due for publication this week and being described as having Dahl-esque tendencies, how does it feel to be compared to such a legendary author? It’s flattering, of course, but I don’t write novels in order to compete with or be compared to other novelists. I write because I have a story to tell, a story that has sprung entirely from my own imagination. Having said that, I grew up (like so many children) reading Roald Dahl and looking back at his books, I feel his extraordinary gift was to be able to make readers laugh or cry or feel frightened or simply enjoy the absurd. For any writer, to be compared to a figure of such importance is an enormous honour. Where did you get the idea from for such a wonderful character as Barnaby? Opposite my home in Dublin is a park – Marley Park – where I take my dog Zaccy for a walk most days. I had been thinking about writing a book for young readers that would explore how it felt to be different because all of us in childhood, I think, feel different at times. Zaccy was pulling his lead and as we walked along an image came to my mind – wouldn’t it be funny if, while walking my dog, I was carrying another lead in my other hand and attached to that lead was a small floating boy. A boy who was different. A boy who didn’t fit with the norm. And by the time we got home again the entire story had presented itself in my mind. The tone and content is extremely different from The Boy in the Striped Pyjamas. Was this an easier book to write emotionally? Of the ten novels I’ve written – seven for adults and three for children – the two easiest to write have been my most recent adult novel The Absolutist and The Terrible Thing That Happened To Barnaby Brocket. Not easy in the sense that I could write them particularly quickly or that they did not challenge me in some way, but the stories in both novels seemed so clear to me from the outset that I was never having to ask myself what might happen next. Barnaby was also a tremendously fun novel to write, certainly the most enjoyably writing experience I’ve had. Having left the trenches of World War I behind me when I finished The Absolutist, it was a joy to march into Barnaby’s extraordinary world. The Boy in the Striped Pyjamas is about to be republished by Vintage Children’s Classics, how did you feel when you realised your book had been chosen to be part of such a wonderful selection of classic books? very flattering but also very wonderful! But then the great thing about the new Vintage Children’s Classics list is that it encompasses old and new books, from Treasure Island to The Curious Incident of the Dog In The Night-Time, from The Secret Garden to, yes, The Boy In The Striped Pyjamas. Have you read any of the other books on the Vintage Children’s Classic Books, and if so which ones did you love? Yes, I’ve read most of them. A novel that had a very strong effect on me growing up was The Silver Sword by Ian Seraillier. It was an early introduction to the Second World War and the Nazis and it scared and fascinated me in equal parts. 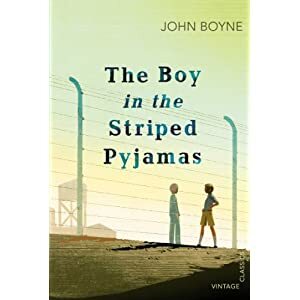 I read it when I was about ten or eleven years old and it was certainly an influence on my writing, twenty years later, The Boy In The Striped Pyjamas. But all the books on the list are worth reading and re-reading. They are classics because they are timeless works of art, novels that can be read by children and adults alike, generation after generation. You have written books for both adults and children. Do you begin each book focusing on which market you want to aim it at? Yes, in recent years I’ve moved between the two audiences and my plan for the rest of my writing career is to follow every adult novel with a children’s novel (and, obviously, vice versa!) I enjoy the change of pace between the two types of storytelling but I devote as much effort and commitment to both and I certainly feel that the issues which I have written about in my three children’s books to date – the Holocaust, the impending death of a parent, and how it feels to be different – are ones which are important and relevant, regardless of the audience. You have been producing award winning books for quite some time, with the experience you have now, do you find that the writing process gets easier with each book? Not easier, no. But with experience comes confidence and with confidence comes much more freedom. I’m not intimidated by any subject in the way that I might have been ten years ago. Every novel is a challenge to write and each one takes complete focus and concentration. But I love writing and I love the process of beginning, working on and completing a novel. It’s extremely fulfilling. No, I write a first draft from beginning to end without doing any editing at all. I prefer to complete a manuscript, even if I know that it is a bit of a mess. Only when I finish the first draft do I really understand what the novel is about and that’s when I go back to the start and begin again. Most of my novels take about 12 drafts before I’m ready to show them to my agent or editor. Do you plot your book completely before you begin writing or do you fly by the seat of your pants? When I first started writing novels in the mid 1990s I used to plan the novel entirely before I began, chapter by chapter, scene by scene. I think for a young writer who is still learning how to construct a novel, this is the best way to begin. However as time has gone on and I have grown more confident as a novelist I prefer not to know what it’s about but I do need to know the general theme. I find it very exciting simply to begin with a character and an idea in my head and to let the story develop day by day before my eyes. If you could be any other author in history for one day, who would you like to be and why? I’ve always wondered how the great 19th century novelists managed to write a long novel every year by hand without any of the editing or copy and paste facilities that we have today. And they still produced masterpieces! So I’d like to be Dickens or Thackeray or Wilkie Collins and find out just how they managed to do that! If you had to recommend one book which you hadn’t written yourself, to a class of children, which book would it be? I’d recommend David Copperfield by Charles Dickens. It’s my favourite novel. Do you have any advice for aspiring and unpublished authors? Read a lot. Too many young aspiring writers don’t read, it astonishes me. Write every day. Even Christmas Day. Join a writing group. Give work to others to read. Learn what it means to read their work and be able to discuss it. And when you finish a short story or a novel – send it out. Don’t put it in a drawer. It’s no use to anyone there. Thank you John for such fabulous answers. Both books are available from all major bookshops from the 2nd of August. I love this feature and this interview is wonderful! The Boy in the Striped Pyjamas is an important and touching book (and the movie is very good, too). I need to reread David Copperfield. Fantastic Interview! 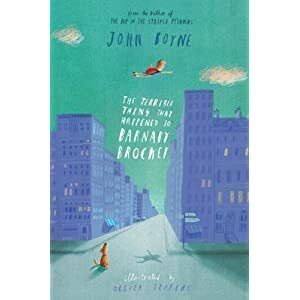 I love how the idea for Barnaby Brocket came about - its such an amazing book and I cant wait to read more of Johns books!